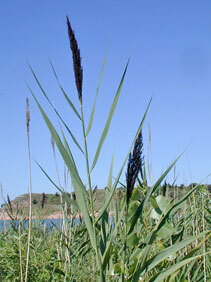 Phragmites australis (Cav. ) Trin. & Steud. Culms: Erect, stout, round, leafy, glabrous, hollow. Blades: Flat, 6 to 22 inches long, 1/2 to 2 inches wide, glabrous, tips tapering to long points. Ligules: Membrane backed by fringe of hairs. Inflorescences: Panicle, large, dense, terminal, 6 to 16 inches long, plumelike, initially purplish, turning tan; apex nodding at maturity; branches ascending. Spikelets: Numerous, about 1/2 inch long, 3- to several-flowered, stalked, rachilla with long, silky hairs up to .4 inch long; florets successively smaller; glumes unequal, lanceolate to narrowly elliptic, tips long-pointed; lemmas linear-lanceolate, about 1/2 inch long, narrow, glabrous, 3-nerved, tips tapering to points. Habitat: Wet areas; stream banks, lake borders, and marshes. Distribution: Throughout Kansas but infrequent in southeast corner. Uses: Native Americans used the stems to make pipestems, arrow shafts, baskets, and mats. The roots were sometimes used in treatments of stomach problems and diarrhea. The Paiute dried the sap and used it as candy/sugar. Comments: Rhizomatous; forms extensive colonies.